The European Commission has recently proposed to upend decades of international tax cooperation and introduce a new three percent tax on corporate turnover from digital advertising and online intermediation services. The proposal is not just remarkable for the actual design of the tax; it is equally notable that the digital services tax is proposed without any supporting evidence that it is in EU Member States’ economic and fiscal interest to tax digital business models differently. The proposed tax on turnover would undoubtedly have direct and indirect consequences for many firms and for economic activity, and it is neither reasonable nor credible to assume that this tax would not have enough impact on EU economies to warrant a full tax-economic impact analysis. The Commission’s own impact assessment was sharply criticised by the EU’s Regulatory Scrutiny Board. Simplistic and narrow in scope, the Commission’s assessment fails to take account of the most common consequences of business taxes and any policymaker who cares about the health of Europe’s economy should send back these proposals to the Commission and ask for a response to the following five questions: first, what is the incidence of the proposed digital services tax – that is, who will actually carry the economic burden of the tax? Second, won’t the digital services tax impact on downstream output and offline sales? Third, won’t the digital services tax particularly hurt SMEs and micro businesses and change competition between large and small firms? Fourth, won’t a digital services tax effectively become a tax on investment in the EU? And lastly, won’t this tax become a levy on innovation, economic renewal and economic convergence in the EU? There is a campaign underway for introducing new taxes on digital services – or firms with certain digital business models. For its part, the European Commission has recently proposed to introduce an EU-wide revenue tax on advertisement and online intermediation services: the digital services tax. This tax would directly target large and highly innovative technology-driven companies like Google, Facebook, and Microsoft. But these companies are hardly the only casualties of the digital services tax. The tax would impact on those consuming digital services, particularly SMEs and micro businesses and their employees and customers. Unlike corporate income tax that applies to profits, the effect of a revenue tax would be far wider and have an impact on Member States’ economies. No tax has neutral economic effects – and certainly not taxes on revenues. Just like other taxes on corporates, firms will respond to the digital services tax and the response is dependent on their capacity to ultimately avoid bearing the cost of the taxes. Ultimately, this is a tax that would have to be paid by workers and the micro entrepreneurs that use the services. In addition, it is not a distant notion that some firms, especially those that are loss-making or operating at low-profit margins, will have to go out of business or make strategic decisions to exit particular markets that are not economically viable. Every observer of taxes knows they have direct and indirect effects. A tax on the gross revenues of digital service suppliers would substantially impact on the overall effective tax burden, particularly the tax burden of low profitability or loss-making companies, with adverse effects on solvency and downstream companies that depend on digital services. Remarkably, the wider effects of the digital services tax have not yet been assessed by the EU. Even more remarkable, two days after the release of the legislative proposals, the EU’s own Regulatory Scrutiny Board sharply criticised the Commission for not putting forward an adequate analysis of the magnitude of the underlying problem and for not quantifying the economic costs and regulatory burdens that would result from a new tax or a new definition of the tax base (RSB 2018). Importantly, the impact assessment by the Commission does not even provide information that is needed to assess whether digital taxes actually would have the intended effects. The Commission does not address the highly critical matter of tax incidence, i.e. who is bearing the financial burden of the digital services tax. Nor does it provide information about the impact on the behaviour of firms and individuals, which will be directly and indirectly affected, and their incentives to produce, invest and consume. Finally, the systemic implications for future economic development (dynamic, i.e. medium to long-term, effects) and the prospects for economic renewal and convergence in the EU are entirely neglected despite the fact that the tax aims to target companies that represent a substantial part of innovation in Europe’s economy. This paper will raise the questions that policymakers will have to respond to if they insist on the merits of the proposed digital services tax. Section 2 will outline the major features of the European Commission’s proposals and look at the broader policy narrative for why the Commission and some Member State governments want to take particular action against so-called digital firms. Section 3 outlines what the Commission has to do now to allay concerns that the digital tax proposal is a pure political product with few linkages to serious tax analysis. Section 4 concludes the paper. On 21 March 2018, the Commission proposed a special tax on certain digital services and presented it as a tax on large “digital” companies (European Commission 2018a; 2018b). Due to its applicable thresholds for turnovers, the taxes proposed by the European Commission would almost exclusively affect the revenues of companies that are currently headquartered in the US, namely those providing digital advertising and online intermediation services, e.g. Google, Amazon, Facebook, Uber, AirBnb – companies which have been explicitly outlined in the European Commission’s “Draft Justification for EU Action” from 26 February 2018. Based on the design, architecture and revealing structure of the Commission’s proposal, the US government is likely to come to the conclusion that the measures constitute a disguised restriction on international trade. And indeed, the US government already signalled to challenge the European Commission’s proposals for a new EU-wide digital tax, warning to take the Commission’s plans to a tribunal of the WTO (Handelsblatt Global 2018; FAZ 2018). The European Commission has set out its ambition for digital taxation in two new proposals. The first proposal is about so-called “digital presence” or “virtual permanent establishment”, which is the Commission’s preferred long-term legislation. It is based on the assumption that “digital” businesses should be taxed where they have significant interaction with users “through digital channels”. In practice, the proposal aims to tax so-called digital platforms (two-sided markets), thus enabling EU governments to tax profits that are “generated” in their territory even if businesses do not have a physical presence there. The right to tax would only apply to digital platforms that meet at least one of the following criteria: 1) it exceeds a threshold of seven million EUR in annual revenues in a Member State, 2) it has more than 100,000 users in a Member State in a taxable year, and 3) over 3,000 business contracts for digital services are created between the company and business users in a taxable year. Even though the Commission explicitly acknowledges global efforts within the G20 and the OECD to reform current principles and treaties on corporate income tax, it still proposes an interim tax on “certain revenues” from digital services that “escape the current tax framework entirely”. Accordingly, the second proposal suggests a tax on “revenues created from activities where users play a major role in value creation”. This tax would be imposed on 1) revenues from selling online advertising space, 2) revenues from digital intermediary activities, which allow users to interact with other users and which can facilitate the sale of goods and services between them, and 3) revenues created from the sale of data generated from user-provided information. A tax of three percent is envisaged for companies with total annual worldwide revenues of 750 million EUR and intra-EU revenues of 50 million EUR. Tax revenues would be collected by the Member States where the users are located. This tax initiative reflects the conclusions of the European Council of December 2017 and the preference of some governments to introduce a digital tax. Before that summit, ten EU Finance Ministers co-signed a joint political statement in favour of “a so-called ‘equalisation tax’ on the turnover generated in Europe by the digital companies.” The Council, however, did not provide any suggestions for the actual design of a digital tax or the defining characteristics of a digital corporation. Aware of national obligations in international tax agreements, the Council rather demanded that an “equalisation levy based on revenues from digital activities in the EU” should “remain outside the scope of double tax conventions concluded by Member States.” (European Council 2017 pp. 1). Who will actually pay for the digital services tax? The European Commission does not say much about the impact of the digital services tax. Importantly, the Commission has completely ignored the most critical aspect of any tax on a corporation: who will actually bear its economic burden? Or to put it simply: who will actually pay for it? This is important because it is only people – not organisations – that can bear the burden of a tax (see, e.g., Harberger 1962; Vasquez-Ruiz 2011; Fuest 2013). In most countries, firms are required to pay corporate taxes to national tax authorities, but they are ultimately not those carrying the cost of a tax. For firms, any tax is a cost that will be covered by other sources than the corporate entity and, therefore, only individuals can bear that economic burden. Economists call this the “effective incidence” of the tax. For taxes on corporate income and revenues, the financial burden of the tax is borne by its owners (shareholders), creditors, employees, suppliers and its customers – to different extents. That is exactly what makes new types of corporate taxes important to analyse before they are introduced. A credible analysis of the digital services tax has to take account of the tax incidence. For instance, the customers of a taxed firm can bear the financial burden through higher prices. Employees of the taxed firm can be affected by layoffs or lower wages. Suppliers to the taxed firm may have to sell at lower prices or, as a second-round effect, reduce wages or lay off workers too. The literature about the incidence of taxes is extensive and established organisations for international economic cooperation – e.g. the OECD and the IMF – have a vast reservoir of knowledge of the incidence of specific corporate taxes. Theoretically, both corporate income and revenue taxes can ultimately fall on a firm’s shareholders through lower returns, and this seems to be the underlying assumption in the Commission’s own analysis. However, the design of the digital services tax, platform network effects and the current competitive landscape of online platforms suggest that customers, both B2B and eventually final consumers, will bear a much larger part of the burden than shareholders. This distribution of effects is generally critical to understand in order to have efficient taxes. In the case of the digital services tax, it is even more important: the Commission is branding the digital tax as a measure to improve tax fairness, but it does not present any evidence suggesting that these taxes will actually be paid by resourceful shareholders rather than margin-squeezed suppliers, customers, workers and the great number of self-employed persons depending on digital services. What if the main casualty of the digital services tax is self-employed persons and workers employed by those firms that benefit and largely depend on digital advertising and online platform sales, e.g. online traders, restaurants and hospitality businesses? That is not a distant notion. Much of the focus in the empirical literature concerns the allocation of the corporate tax burden between owners of capital, workers and consumers. Thereby, studies take account of the openness and size of the economy, capital/labour and product substitution elasticities inside a country or across countries, and specific factors related to a sector or if there are alternative products available (Clausing 2012; Vasquez-Ruiz 2011). Ideally, a proper assessment about how the burden of a tax on corporate income – or corporate revenue – is apportioned between workers, suppliers, customers and owners would require analysis at firm level rather than merely looking at aggregate variables. Firm-level studies are, however, scarce. But studies that focus on aggregates, e.g. groups of corporations and ranges of wages, find that workers generally bear the largest share of the burden, estimated to amount to 50 to 70 percent of the revenues raised from corporate taxes. For the digital services tax, this would include a vast number of self-employed persons. Only the remainder of the burden goes to customers, suppliers and shareholders, depending on how much alternative choice they face and how mobile they are. As a general rule: the more mobile shareholders, suppliers and customers are, the lower the burden borne by them will be, and the more goes to those who are immobile. Owners and shareholders, whose capital is fairly mobile internationally, are generally well-equipped to divest in a high-tax jurisdiction to escape the tax and move capital to low-tax jurisdictions which offer better risk-return profiles. Suppliers, which are generally less mobile, can only escape lower prices if they find customers that are willing to pay more for the products and services they offer. Customers, which are usually relatively immobile, would have to go for alternative goods and services to avoid paying more. Workers are the least mobile factor. As customers (B2B and B2C) tend to be less mobile than capital and international suppliers of goods and services, the Commission’s proposal raises the question about the extent to which the digital services tax will be shifted to customers, e.g. through higher prices for certain online intermediation and advertising services, and higher prices for final consumers respectively. This would generally be possible if these services cannot easily be replaced by services from alternative suppliers domestically or from abroad, which is the case for many platform services which allow firms and consumers to benefit from unique network effects. As the digital services tax would affect sectors where the competition usually comes from other firms than big technological companies, these businesses would be affected by the digital services tax too. The effect is critical for understanding if the digital services tax will ultimately lead to lower wages and salaries, less employment in companies depending on digital services and higher consumer prices. Won’t the digital services tax affect downstream output and offline sales? It is implausible that the main effect of the digital services tax would be that shareholders of the taxed firms accept higher taxes and lower margins. After all, their global effective tax rate is actually high (often higher) or comparable to other large and less digital enterprises like Volkswagen and Louis Vuitton (LVMH) and sectors like manufacturing or foods and beverages (Bauer 2018). It is simply untrue that there are vast untaxed digital profits out there that could be taxed by European governments without effects on others. Consequently, many firms would pass on the tax to others, and some of those would be downstream users and customers. Indeed, for indirect taxes (value-added, excise and sales taxes) there is a vast amount of empirical evidence suggesting that companies pass on these taxes to a significant extent to consumers through higher prices for goods and services (see, e.g., Cawley and Frisvold 2016; Benedek et al. 2015; Smart and Bird 2009; Carare and Danninger 2008; Carbonnier 2007). Importantly, numerous studies report significant over-shifting effects for new taxes or tax increases: changes in taxes drive price increases that are bigger than the original tax increase (see, e.g., Bergmann and Hansen 2010; Besley and Rosen 1999). In addition, the tax-induced-price increase is often found to be higher the smaller a market and the lower competition in this market (see, e.g., Etilé et al. 2018; Andrade et al. 2015). As those companies effectively targeted by the Commission are in fact leading players in the markets for online advertising and online intermediation services – and leaders in the innovation cycle –, it is very likely that the digital services tax will to a substantial extent be passed through to consumers. The size of that effect is debatable, but it is obvious that the burden of a tax on digital services will to some extent be passed on to the consumers of these services. At firm-level, it is very likely that the magnitude of the pass-through effect is much higher for low or negative margin operations. A company with a two percent profit margin will simply have no choice but to pass on the tax burden to downstream consumers in order to commercially survive. Not passing the tax on to consumers would wipe out business profitability and result in lower levels of market competition and upward pressure on the prices charged by other companies to downstream consumers. Why wasn’t it a priority for the Commission to study the effects? After all, these customers are other businesses, including many SMEs, micro businesses and self-employed persons, but also public institutions in Europe. Digital advertising, for instance, is a cost-effective marketing tool, which often allows firms to reach their target audience better than most other forms of marketing. The top advertisers on Facebook are large companies, usually operating internationally and of which many are headquartered and taxed in the EU (Nielsen 2018). But advertising and online intermediation are also increasingly used by start-ups and SMEs to create new business opportunities and to develop stronger market positions (see, e.g., Rugova and Prenaj 2016). For many SMEs and micro businesses such as restaurants and craftspeople, online advertising is a big driver of their offline sales. In addition to businesses, public institutions are frequent, large and, therefore, important customers of online advertising companies like Facebook and Twitter. Germany’s Ministry for Defence, for example, is a large customer of Facebook, spending 3.34 million EUR on advertising services between 2013 and 2018, followed by the Ministry of Justice (450,000 EUR), and the Ministry of Healthcare, spending 400,000 EUR for campaigns on healthcare education (Epoch Times 2018). As for online intermediation services, Amazon’s Marketplace for businesses allows public institutions to drive savings for taxpayers and at the same time reduces procurement complexity, the potential for fraud and the cost of monitoring of compliance (AmazonBusiness 2017). Taxing these services would probably increase their price and decrease the value-added generated by these services on the part of those who use and depend on them. Won’t the digital services tax particularly hurt small and micro businesses? There is a related question on the effects on downstream users that is particularly important to Europe’s SMEs and micro-firms: won’t the effect of the digital services tax hurt small businesses the most? Survey data for the EU demonstrate that the use of online platforms is already very important for SMEs: 37 per cent of SMEs surveyed already sell their products and/or services on the Internet (Eurobarometer 2016). Lacking the administrative capacities of large companies, SMEs and micro businesses are the ones who mainly benefit from new marketing opportunities and lower costs in accessing foreign markets. When the tax burden is passed on to B2B consumers of online services, the adverse impact generally affects corporate customers in other sectors of the economy as well as final consumers of literally all types of digital and non-digital goods and services. Since digital advertising and online intermediation services are to a large extent consumed by SMEs and micro businesses that operate with low-profit margins and often limited scope to pass on the tax burden to consumers, it is these companies where the ability to add value as well as profitability and solvency is put at risk (see, e.g. Gatautis et al. for a recent analysis about how SMEs use possibilities of platforms to innovate their own business models). Small and micro businesses provide the customer base for many tech companies. The majority of corporate customers of Facebook are SMEs (Real Business 2017). Similarly, more than half of all items sold on Amazon online come from SMEs (CNBC 2017). As key users of digital platforms with very high switching costs, SMEs and micro businesses look likely to be most affected by taxes on online intermediation and digital advertising services. It is relatively easy for big tech companies to pass on the tax burden to small firms because of their limited bargaining power (contrary to large companies consuming these services at special conditions) and the network effect of platforms. Smaller firms, especially the consumers of digital services, are in a different situation. It is cost-effective to buy ads on Facebook, and there isn’t exactly a direct rival to Facebook out there that could offer a similar service. Other services can only offer the outreach effect at much higher costs, e.g. higher average costs for clicks or much higher costs for reaching the same number of potential customers. Therefore, is there a risk that the digital taxes will change the competitive balance between large and small firms to the advantage of the former? After all, a digital services tax is likely to further deteriorate the price negotiation power of large firms compared to small businesses and self-employed persons using digital services to make a living. Could the digital services tax become a tax on investment in the EU Member States? If the existing knowledge of corporate income tax is a good bellwether for the digital services tax, the essence of incidence and pass-on effects is that the digital services tax would indeed become a tax on investment in the EU. If that happens, the economic cost of the digital services tax would be much higher over time than the static effects that would result from higher prices for consumers or lower wages for workers. A digital services tax could push technological innovation and experimentation with new business models outside the EU. Europe could simply become a less hospitable place for innovative entrepreneurs that want to contest markets and challenge incumbents. Given the strong desire on the part of the European Commission to expand the Digital Single Market and make EU Member States leaders in digitalisation, it was expected that the digital services tax would come with a strong motivation to show why the taxes would not hurt investment and digital innovation in EU Member States. In reality, though, there is nothing in the Commission’s analyses that address these concerns. Why is this important? Competition for return on investment (ROI) is a key feature of market economies. The tax incidence borne by investors and shareholders decreases the relative competitiveness of investments in the EU for those companies that are directly affected by the tax. If you run a digital company that is dependent on external funding for its survival, a three percent tax on turnover would require even more – potentially, a lot more – external funding. Moreover, a digital services tax would likely reduce investment in those companies that depend on the taxed digital services to generate value, including non-digital SMEs and micro businesses using digital platforms for offline sales and advertisement services. Accordingly, a tax on certain digital business activities would decrease the relative attractiveness to invest in all those businesses that are directly and/or indirectly affected by the tax. Moreover, it is an illusion that a digital services tax would fall only on those firms that are non-European. A tax exclusively levied on revenues made in the EU would not only hit large digital companies from abroad (mainly the US); it would also hit digital and non-digital companies headquartered or located in EU Member States aiming to grow and gain market shares globally. A digital services tax would make them reconsider a relocation in order to be able to grow and expand in a better tax environment such as the US or Asian countries. The relative attractiveness of the EU as an investment hub for growing digital companies and innovative, digitally-enabled businesses (often digital and non-digital SMEs) would decrease. Investors seeking a good return on their investment would move capital in general and future FDI in particular to other jurisdictions that offer a similar investment environment, but lower burdens from corporate tax. As a result, EU Member States would see less investment in innovative businesses through venture capital and other means of corporate finance. Consequently, the likely impact on liquidity, profitability and returns on investment will deter investment in innovative technologies and new business models in the EU. Any corporate tax, irrespective of its actual tax base, negatively impacts on the cost, cash flow, liquidity and the profitability of a company. These financial indicators matter for investors seeking a certain return on investment. The relationship between corporate taxes and investment activity is well-documented in tax analysis. As a general rule, complex and compliance-intensive tax rules and a high tax burden deter investment in jurisdictions whose tax systems show these characteristics. There is a critical factor with new firms and business models which needs consideration: many of the firms that drive innovation and economic renewal in the digital space make losses. For instance, many unicorns in Europe – companies that are valued at more than 1bn USD – do not make profits. And those who are profitable usually were not for a long period of time because young and growing firms have to invest so much in order to reach scale. It stands to logic that a digital tax on gross revenues (rather than profits) would disproportionally punish those companies that are loss-making or operating on low-profit margins. This holds true for those digital companies that are directly affected by the digital services tax and those to which the burden is passed on. In fact, a revenue tax on digital firms would be a very regressive tax – and its effect could potentially be that there will eventually be fewer companies with the capacity to compete with incumbents. 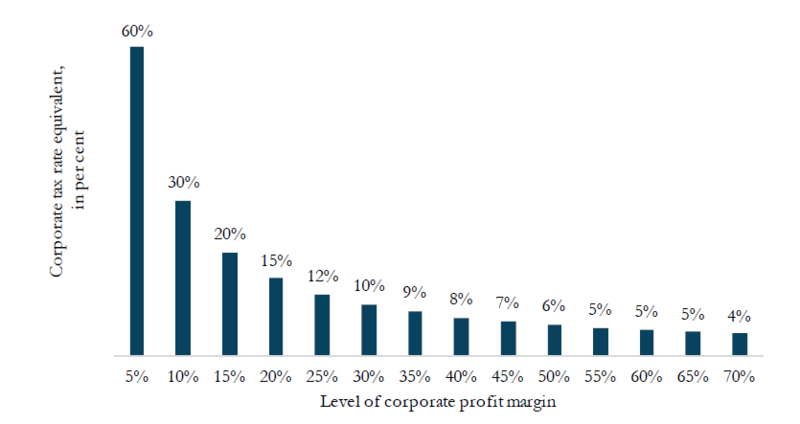 As shown by Figure 1, the overall impact of a revenue tax of three percent is negatively correlated with corporate profitability. For a company with a low-profit margin of five percent, the tax would be equivalent to a corporate income tax rate of 60 per cent. For a company with a high-profit margin of 50 per cent, the tax would be equivalent to a corporate income tax rate of only six per cent. In other words, even if crediting of these taxes against standard corporate tax paid in other jurisdictions would be allowed, a low-profit company may still have to bear a disproportionally higher tax burden compared to high-profitability companies. In addition, an exclusive tax on the gross revenues of certain digital services in the EU would hit those companies that invest to grow and to break even, aiming to become a profitable business or even a profitable globally-operating company. A tax on gross revenues may even turn a profitable business into a loss-making entity and therefore threaten its solvency, i.e. its overall existence and employment respectively. That does not just mean small single-person start-ups. A tax on the gross revenues of Spotify, for example, which is a large European digital platform-based company that still does not make profits (Spotify started in Sweden in 2008), would further turn this company into the red and wipe out its operating capital. Investors are likely to withdraw some funding, urge the management to stop investments in growth in the EU, or relocate operations to non-EU countries if they are confronted with taxes that disproportionally hit young, growing and loss-making firms. Finally, in its proposal on detailed technical amendments to EU rules on value-added tax (VAT) of May 2018, the European Commission calls VAT “one of the most growth-friendly forms of taxation” and argued that before the introduction of common Value Added Tax (VAT) system “turnover taxes distorted competition and hindered the free movement of goods” (European Commission 2018f). It is surprising that the same strand of the European Commission is now advocating taxes on revenues made from digital services, which would distort competition within the EU. As these taxes would prevent a number of low profitability EU businesses to continue to trade and expand across EU borders, the digital services tax would, as recognised by the Commission, effectively hinder the free movement of goods and services in the EU’s (Digital) Single Market. Could the digital services tax hurt innovation, economic renewal and convergence in the EU? Innovation is a driver of change – and, for a decade or more, new digital enterprises have helped to change many sectors and economies for the better. Online platforms, for instance, enable interactions between multiple intermediate and end-users. They create value-added for both sides of the market, producers and consumers of goods and services. Accordingly, the real economic benefits of Amazon, Google, Facebook, Airbnb and others are not created where these companies are headquartered, but where their services and innovations are adopted, i.e. corporations and consumers using these services across the globe, with extremely positive impacts on employment and personal incomes. Consequently, it is important to understand if a digital services tax actually would become a tax on the economic benefits generated and fuelled by digital innovations. That question needs a response by the supporters of the digital services tax before it should even be considered. We have already touched upon the potential damages to SMEs and micro businesses likely to result from a digital services tax, but there is also a specific concern related to innovation: it is very often new firms that bring innovation to the market and platforms spurring small businesses’ sales, growth and employment. Making the benefits for small businesses costlier to adopt naturally comes with the risk of raising the barriers to economic renewal in the EU and would prevent economic convergence of EU Member States. Various assessments about the impact of digital taxes can be found in OECD 2018, 2017a, 2017b, 2017c. The argument of the Commission is that the profit margins of digital firms are substantially higher than in comparable firms (European Commission 2017), even though this claim is not supported by empirical data (Bauer 2018): ergo, they, according the reasoning of the Commission, should be taxed more. However, the more important problem with such reasoning is that investors and shareholders are likely to escape this burden when economies are open and capital is mobile. They could also escape the burden when they find other ways to maintain profitability, e.g. to pass on the burden to workers and their customers. It should be noted that companies affected by the tax can only change prices if suppliers (lower prices) and customers (higher prices) face high switching costs. The European Commission has presented ideas for a digital services tax – specifically addressing digital firms on the motivation of improving the corporate income tax. The Commission has not presented any supporting evidence about the consequences of this tax. The Commission was duly criticised by the EU’s Regulatory Scrutiny Board for not saying much about the impact of the digital services tax – and that criticism can be widened. First, the Commission ignores the fact that only people – not organisations – can bear the burden of a tax. While firms are formally required to pay corporation taxes to national tax authorities, they do not bear the economic burden of the tax. The question for all policymakers that are careful about taxes is first to inquire where the tax burden will be passed on to and whether this is actually the people they want to tax, e.g. workers, self-employed persons and final consumers. Second, corporate tax practices will change as a consequence of the digital services tax – and new corporate taxes will certainly have an effect on tax planning. Corporate taxes, in general, are far from being user-friendly. On current trend, a digital services tax would only add another opaque layer to corporate taxation in the EU. In addition, the tax world knows thousands of bilateral tax treaties, annexes, protocols, technical explanations and memoranda of understanding. Bespoke bilateral agreements add complex layers of regulations to a largely non-transparent and in many ways discriminatory tax regime. A digital services tax would only aggravate this situation and further undermine the willingness of national tax authorities to cooperate internationally to simplify domestic and international tax rules. A digital services tax would create new loopholes and economically benefit those identifying these loopholes, i.e. lawyers and tax advisors. Despite the Commission’s intention, a digital services tax would likely exacerbate practices of profit shifting and distract attention away from the urgent need to improve international rules for taxation. Andrade, P., Benassy-Quere, A.. and Carre, M. (2015), Competition and pass-through on international markets: Firm-level evidence from VAT shocks, Paris, CEPII. AmazonBusiness (2017), The Amazon Business Marketplace for Government, available at https://nasca.org/Portals/21/2017%20Institute/Whitepapers/Amazon_Business_for_Government.pdf. 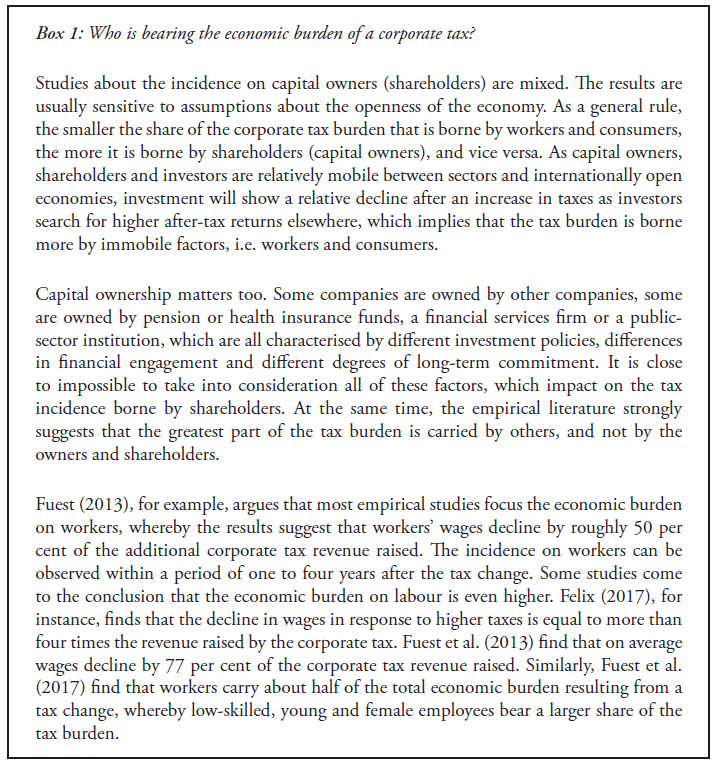 Bauer, M. (2018), Digital Companies and Their Fair Share of Taxes: Myths and Misconceptions, ECIPE Occasional Paper, 03/2018. Benedek, D., de Mooij, R., Keen, M. and Wingender, P. (2015), Estimating VAT Pass Through, IMF Working Paper 15/214. Bergmann, U. M. and Hansen, N. L. (2017), Are Excise Taxes on Beverages Fully Passed Through to Prices? The Danish Evidence, Department of Economics, University of Copenhagen. Besley, T. J. and Rosen, H.S. (1999), Sales Taxes and Prices: An Empirical Analysis, National Tax Journal, Vol. 52, No 2, pp. 157-178. Biagi, F. and Falk, M. (2017), The impact of ICT and e-commerce on employment in Europe. Carare, A. and Danninger S. (2008), Inflation Smoothing and the Modest Effect of VAT in Germany, IMF Working Paper No. 08/175. Carbonnier, C. (2007), Who pays sales taxes? Evidence from French VAT reforms, 1987–1999, Journal of Public Economics, Volume 91, Issues 5–6, June 2007, Pages 1219-1229. Cawley, J. and Frisvold, D. E. (2016), The Pass‐Through of Taxes on Sugar‐Sweetened Beverages to Retail Prices: The Case of Berkeley, California, Journal of Policy Analysis and Management, Volume 36, Issue 2, Spring 2017, pp. 303-326. Clausing, K. A. (2012), In Search of Corporate Tax Incidence.” Tax Law Review. 65:3. 433-472. CNBC (2017), Small business is providing big power behind Amazon, article published on 26 December 2017, available at https://www.cnbc.com/2017/12/26/small-business-is-providing-big-power-behind-amazon.html, accessed on 6 May 2018. Eurobarometer (2016), Flash Eurobarometer 439, The use of online marketplaces and search engines by SMEs. European Commission (2018a), Proposal for a Council Directive laying down rules relating to the corporate taxation of a significant digital presence. European Commission (2018b), Proposal for a Council Directive on the common system of a digital services tax on revenues resulting from the provision of certain digital services. European Commission (2018c), Fair taxation of the digital economy, https://ec.europa.eu/taxation_customs/business/company-tax/fair-taxation-digital-economy_en. European Commission (2018d), Commission Staff Working Document, Impact Assessment, Accompanying the document “Proposal for a Council Directive laying down rules relating to the corporate taxation of a significant digital presence” and “Proposal for a Council Directive on the common system of a digital services tax on revenues resulting from the provision of certain digital services”, 23 March 2018. European Commission (2018e), European Commission – Press release – Digital Taxation: Commission proposes new measures to ensure that all companies pay fair tax in the EU, 21 March 2018. European Commission (2018f), European Commission – Press release on Fair Taxation: Commission proposes final technical measures to create a future fraud-proof EU VAT system, 25 May 2018. European Commission (2017), A Fair and Efficient Tax System in the European Union for the Digital Single Market, Communication from the Commission to the European Parliament and the Council, Brussels, 21 September 2017. European Council (2017), Council conclusions on “Responding to the challenges of taxation of profits of the digital economy”, Brussels, 30 November 2017. Epoch Times (2018), Bundesregierung kritisiert Facebook – und gibt dort Millionen aus, article published on 23 April 2018, available at https://www.epochtimes.de/politik/deutschland/bundesregierung-investiert-trotz-ihrer-kritik-an-facebook-millionen-fuer-facebook-werbung-a2408091.html, accessed on 6 May 2018. Etilé, F., Lecocq, S. and Boizot-Szantai, C. (2018), The Incidence of Soft-Drink Taxes on Consumer Prices and Welfare: Evidence from the French ” Soda Tax”, PSE Working Papers No. 2018-24. 2018. FAZ (2018), Amerika kritisiert Digitalsteuer scharf, 16 April 2018, available at http://www.faz.net/aktuell/wirtschaft/amerika-kritisiert-eu-digitalsteuer-scharf-15544263.html, accessed on 16 April 2018. Felix, A. R. (2007), Passing the Burden: Corporate Tax Incidence in Open Economies, unpublished paper, October 2007. Fuest, C., Peichl, A., Siegloch, S. (2017), Do Higher Corporate Taxes Reduce Wages? Micro Evidence from Germany, ifo Working Paper No. 241. Fuest, C., Peichl, A., Siegloch, S. (2013), Do higher corporate taxes reduce wages? IZA Discussion Paper No 7390. Fuest, C. (2013), Who bears the burden of corporate income taxation?, ETPF Policy Paper 1. Gatautis, R., Vitkauskaitė, E. and de Reuver, M. (2017), Use of Facebook and Google Platforms for SMEs Business Model Innovation, BLED 2017 Proceedings, 38. Handelsblatt Global (2018), Trump set to tussle over EU digital tax plans, 16 April 2018, available at https://global.handelsblatt.com/politics/trump-america-eu-digital-tax-google-911691, accessed on 16 April 2018. Harberger, A. C. (1962), The Incidence of the Corporation Income Tax,” Journal of Political Economy 70, 215-240. Nielsen (2018), Die Top Advertiser im März 2018, available at https://www.internetworld.de/online-marketing/digitale-werbung/top-advertiser-im-maerz-2018-1532301.html, access on 6 May 2018. OECD (2018), The OECD’s interim report on tax challenges arising from digitalisation: An overview, Paris, 20 March 2018. OECD (2017a), Tax Challenges of Digitalisation, Comments Received on the Request for Input – Part I, Paris, 25 October 2017. OECD (2017b), Tax Challenges of Digitalisation, Comments Received on the Request for Input – Part II, Paris, 25 October 2017. OECD (2017c), Progress Report on BEPS Action 5 – Minimum standard to combat harmful tax practices, 16 October 2017. OECD (2013), Action Plan on base Erosion and Profit Shifting, Paris. OECD (2009), Two-sided markets, Policy Roundtables 2009, 17 December 2009. Real Business (2017), Extra SME support as five million businesses now advertise on Facebook, article published on 10 April 2017, available at https://realbusiness.co.uk/sales-and-marketing/2017/04/10/extra-sme-support-five-million-businesses-now-advertise-facebook/, accessed on 6 May 2018. Rochet, J. C. and Tirole, J. (2004), Two-Sided Markets: An Overview. MIT Publication. Rugova, B. and Prenaj, B. (2016), Social media as marketing tool for SMEs: opportunities and challenges, Academic Journal of Business, Administration, Law and Social Sciences, 2 (3) 2016. RSB (2018), Regulatory scrutiny Board Opinion on the “Proposal for a Council Directive laying down rules relating to the corporate taxation of a significant digital presence” and the “Proposal for a Council Directive on the common system of a digital services tax on revenues resulting from the provision of certain digital services”, 23 March 2018. Smart, M. and Bird, R. M. (2009), The Economic Incidence of Replacing a Retail Sales Tax with a Value-Added Tax: Evidence from Canadian Experience, Canadian Public Policy – Analyse de Politiques, Volume XXXV, No. 1, 2009. Vasquez-Ruiz, H. A. (2012), A New Approach to Estimate the Incidence of the Corporate Income Tax, Dissertation, Georgia State University, 2012.